North County's “Dine Out Escondido!” restaurant week returns this January 22-28 better than ever with thirty local restaurant participants offering dining deals, as well as a new partnership in support of the North County Food Bank and a special ride discount offer from Lyft San Diego. 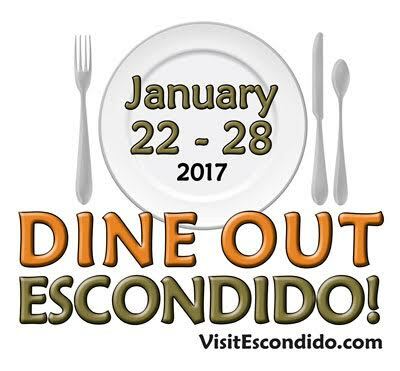 Held in conjunction with California Restaurant Month, Visit Escondido produces the successful annual Dine Out Escondido! Restaurant Week during the last week in January. "With thirty local eateries offering diverse specials, our restaurant week gives everyone a chance to visit their favorites and create delicious new experiences," said Katherine Zimmer, Tourism and Marketing Administrator for the City of Escondido. "And the timing is perfect, immediately following San Diego Restaurant Week!" Each Dine Out Escondido! restaurant participant will donate $1 of every special they sell during the week to the North County Food Bank’s Food 4 Kids Backpack Program. Participating eateries include Black Angus Steakhouse, Brigantine Seafood & Oyster Bar, Carin de Ria, Chili's Grill & Bar, Cocina Del Charro, North County Tavern+Bowl, Oaks Bar & Grill, Offbeat Brewing Company, On The Border, Stone Brewing World Bistro & Gardens, The Wooden Spoon, Vintana Wine + Dine, A Delight of France Bakery & Bistro, Bellamy’s Restaurant, Burger Bench, Cuscatlan Salvadorian Cuisine, Cute Cakes, EscoGelato, Jalapeño Grill, Kettle Coffee & Tea, La Tapatia, Mi Guadalajara, Plan 9 Alehouse, Sunny Side Kitchen, Suzy Q's Diner, The Continental Deli, The Grand Tea Room, Vincent’s, and Vinz Wine Bar. "We are very grateful to the restaurants that are supporting our Food 4 Kids Backpack Program through the Dine Out Escondido! campaign," said North County Food Bank CEO James A. Floros. "Children on the program receive free meals at school during the week, but face hunger over the weekend when school meals are unavailable. Funds raised through Dine Out Escondido! will help us provide weekend backpacks filled with food to elementary school children living in poverty. The North County Food Bank encourages patrons to support Dine Out Escondido! to help us in the fight against hunger." And to make it even easier to enjoy yourself during this eventful week, Lyft San Diego is offering 30% off of rides by using code DOE2017 (up to $5 per ride/up to 4 rides during the week). Available to all new and existing Lyft users. For details of participating restaurants and their specials, go to visitescondido.com/5492/dine-out-escondido-restaurant-week.